There is certainly an attrition in regard to the person we were as a child versus who we are as an adult. Why that happens and if we can continue to be ourselves from adolescence to adulthood is what Little takes aim at. While the movie has some pacing and story issues, the calories you’ll burn laughing evens things out! Jordan Sanders (Regina Hall) is the type of boss you don’t want to have. She’s mean, self-centered, condescending, and has enough money and power to get away with it all. Her assistant, April Williams (Issa Rae), is her talented but overlooked and overworked doormat. Jordan’s latest technological invention, Homegirl (voiced by Tracee Ellis Ross- think Alexa but a cool black version) is in beta testing. When her biggest client, Connor (Mikey Day) gives her 48 hours to give a new innovation before he leaves her firm, Jordan goes Hulk on her employees. She just happens to be mean to a little girl who casts a spell on her in the process. The next morning, Jordan wakes up as the middle school version of herself (Marsai Martin). She quickly pulls in April to help her figure out what’s going on, while using her to continue the day to day activities in the company. Shenanigans ensue as Jordan learns more about herself, friendship, and what it means to be yourself. Both a blessing and a curse, the screenplay fires off jokes like a TV sitcom. It seems like the jokes come at least once per minute of screen time. Many of the jokes hit, but others noticeably don’t. 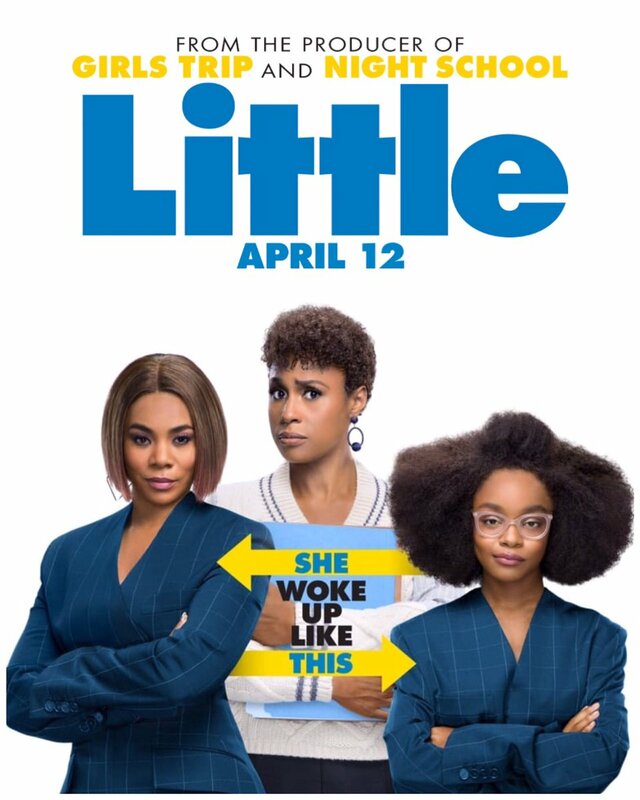 When you have power players like Issa Rae, Marsai Martin, and Regina Hall (while she’s in less of the film in comparison) the funny moments of this film are not just in the dialogue but also in their expressions. All three nail their character’s persona. It is a pleasure to watch Martin outside of her role on Black-ish as she commands the screen acting as a 38 year old in a 13 year old’s body. The rapport between her and Rae is so authentic and infuses life into some of the scenes that in other hands would be hackneyed. While the laughs come consistently and the film taps into some emotional moments, many of the scenes within the film feel common in a bad way. Inspired by the movie Big, Little doesn’t do much innovating in the body switching, Freaky Friday, type of genre. Due to that, some of the storytelling and transitions force you to forgive it for following the leader rather than lead you down a refreshingly original path. Regardless, this film is packed with the right kind of girl power. Co-writer/director Tina Gordon takes us on a funny ride. Both Hall and Martin serve as executive producers on the film, making Marsai Martin one of the youngest executive producers in Hollywood. This movie finds itself lending to crowds somewhere in between date night and an outing with the girls, but it’s an overall entertaining time at the movies.